Magnetic mount cell phone antennas are portable and improve the cell signal on any vehicle with a steel exterior. They work well on passenger cars, pickup trucks, SUVs, vans and can easily be moved from one vehicle to another. Magnetic mount antennas out perform glass mount antennas. Connecting to your phone or device: Connecting a magnetic mount cell antenna to your cell phone, cellular data card or other cellular device requires a phone adapter cable. To connect to other devices may require a coax adapter. Need Maximum Range & Power? Adding an Inline Cellular Booster/Amplifier to your Cellular Antenna/Adapter purchase increases the strength of the incoming signal and boosts your output power up to a maximum of 3 Watts. This 6 inch external magnetic mount cellphone antenna with SMA connector is made of stainless steel and is fully weather-proof. Its designed to be mounted on the roof of the ATM , Lottery machine or use for the modem antenna. This 6 inch external magnetic mount cellphone antenna with FME connector is made of stainless steel and is fully weather-proof. Its designed to be mounted on the roof of the ATM , Lottery machine or use for the modem antenna. This 12.8 inch external magnetic mount cellphone antenna with FME connector is made of stainless steel and is fully weather-proof. Its designed to be mounted on the roof of a vehicle or other metal surface. Great cell phone antenna for situations with minimal clearance. Works great on passenger cars and trucks. Your Price: $29.99 Call For Quantity Discounts! 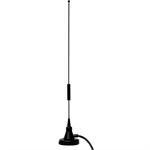 The MDBM dual band mobile antennas provide omnidirectional coverage in cellular and PCS frequencies. They feature a magnetic mount base with protective surface that facilitates secure installation without damage to the vehicle. Premium dual-band magnetic mount antenna, works great on passenger cars and trucks. Laird Technologies Phantom low profile antenna. Covers multiple bands including iDEN, Cellular, GSM900, DCS1800, GPS, PCS, UMTS and ISM/WiFi. Laird Technologies Phantom low profile antenna. Covers multiple bands including iDEN, Cellular, GSM900, DCS1800, GPS, PCS, UMTS and ISM WiFi.